Most people know that pomegranates lower blood pressure, but pomegranate health benefits don’t stop there. Pomegranate is considered one of the top 8 foods to lower blood pressure, because it is so effective in bringing blood pressure readings down. Winter produce can be a bit drab in comparison to the fresh blueberries, raspberries, peaches, and nectarines of summertime. But each winter, I eagerly wait for one of my favorite foods of all time to appear on grocery store shelves: pomegranates. I’ve always loved the task of removing the seeds from this fruit, and I often will eat a whole bowl of them straight with a spoon. If I don’t eat them all in one sitting, I will include these beautiful red seeds in fruit salads or green spinach salads for a special treat. 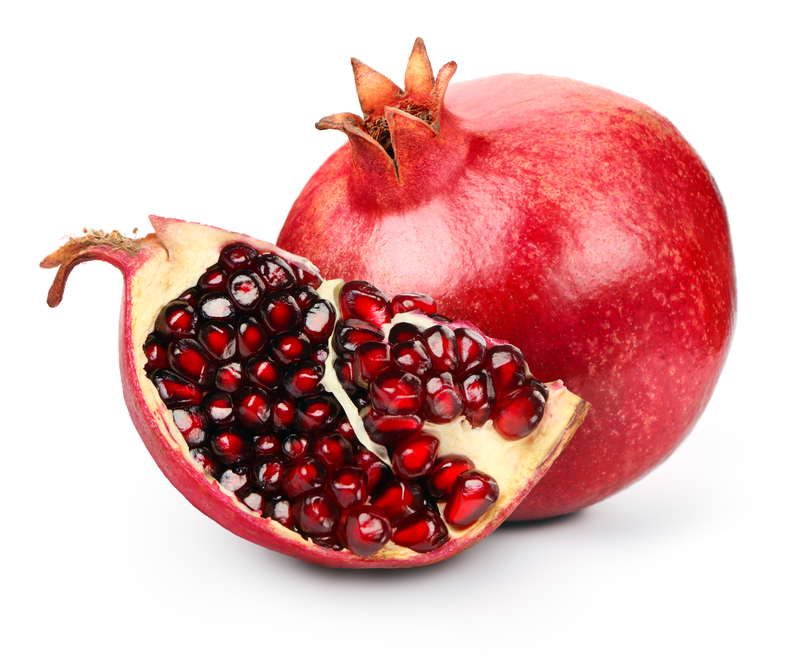 The flavor is just the beginning: Pomegranate health benefits are plentiful and impressive. This antioxidant-rich fruit has a number of health benefits, particularly for your heart. We included pomegranate as one of the top 8 foods to lower blood pressure, because it is so effective in bringing blood pressure readings down. They can also help lower LDL cholesterol and prevent LDL oxidation, which are two factors that can impact your risk for heart disease. Pomegranates are particularly high in antioxidants, including flavonoids, anthocyanins, and tannins. 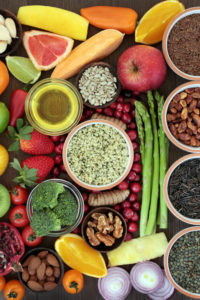 These antioxidants help to reduce oxidative damage, which contributes to problems like Alzheimer’s disease, cancer, osteoarthritis, and many heart-related problems such as atherosclerosis. Pomegranate doesn’t just lower cholesterol levels, however. It also helps prevent the oxidation of cholesterol. When LDL cholesterol becomes oxidized, it can be particularly harmful; oxidized LDL it is more likely to accumulate in blood vessels and cause atherogenesis, the build up of plaques in arteries that leads to atherosclerosis. Laboratory studies show that inhibiting oxidative stress in LDL by feeding animals antioxidants slows the progression of atherosclerosis. Pomegranate juice protects against the oxidation of cholesterol, and helps to reduce oxidized LDL levels in humans, as well. [5,6] For example, people who consumed 50 ml of pomegranate juice per day for one year showed significantly lower LDL oxidation. If you have never done so, try buying a whole pomegranate and removing the seeds. They are delicious in salads, or alone as a snack. Some stores sell the removed seeds near the pomegranate juice, but they’re only available for a limited time each year. Pomegranate juice is a great way to get all the benefits of this fruit in an easy, no hassle way. Drink a glass a day to boost your heart health. Just be sure to choose 100% pomegranate juice, avoiding products with added sugar or other unhealthy additives. If you are on any prescription medications, such as ACE inhibitors or warfarin, you should check with your doctor to make sure pomegranate will not adversely interfere with your medication use. Have you ever experienced these pomegranate health benefits for the heart? Has pomegranate helped you to reach healthy cholesterol readings? Share your favorite ways to use pomegranate in the comment section below. Adv Biomed Res. 2014 Mar 25;3:100. Int J Vitam Nutr Res. 2006 May;76(3):147-51. Br J Nutr. 2010 Aug;104(3):402-6.
ace inhibitors, alzheimer, antioxidant, antioxidants, atherosclerosis, blood pressure, blood pressure readings, cancer, cholesterol, cholesterol levels, cholesterol ratio, cholesterol readings, diet, food, hdl, hdl cholesterol, hdl cholesterol levels, health, heart disease, heart disease risk, heart health, ldl, ldl cholesterol, ldl levels, lower blood pressure, lower cholesterol, lower cholesterol levels, lower ldl, lower ldl cholesterol, lowering cholesterol, lowering cholesterol levels, osteoarthritis, oxidative damage, oxidative stress, oxidized, pomegranate, pomegranate health benefits, spinach, stress, studies show, sugar, to lower blood pressure, triglyceride, triglyceride 2, triglyceride levels. Personally, if I were on any prescription medications, such as ACE inhibitors or warfarin, I would check with my doctor to make sure the medication would not adversely interfere with my pomegranate use, not the other way around! Sadly, fresh pomegranate season ended a few weeks ago, and I can hardly wait until next fall when it starts again. For now I’m making do with buying 100% pure pomegranate juice at my local health food store. I drink a six ounce glass every day. My favorite brand is Lakewood, cold pressed and not from concentrate. Getting a pomegranate tree, or maybe even two, to plant in my yard is high on my to-do list. I don’t know how hard it is to grow a tree from a seed, or how old they have to be before they start bearing fruit, but that’s definitely worth checking into. Sadly I only discovered pomegranates a few months ago, and I didn’t think of trying to plant a seed until the last of them were gone for this year. I know that a lot of people seem to have a difficult time getting the seed pods out without making a mess, but I don’t understand why. They have a skin about the thickness of a banana. I just use a sharp knife to slice the ends off and then barely cut through the skin from “pole to pole” as it were, and break it apart into four quarters. For me a single serving is one quarter of the whole fruit. To “prepare” it, I simply hold a 1/4 piece over a dinner plate and essentially turn it “inside out.” It only takes about two minutes from there to gently separate all the seed pods from skin without breaking a single pod, and then dump them into a bowl. Who needs a spoon? I just eat them, seeds and all, with my fingers. Thank you for your comment! I too, often skip the spoon and start snacking before I can even get to the silverware drawer. If you ever do try to grow a pomegranate tree, please let us know how it goes! I would love to hear about your experience. Pomegranate seeds are my favorite salad topping. But their fresh season is definitely too short!